The Life & Tragedies of Scott Summers Part 3: Cyclops, The Bad Dad – AiPT! The third chapter in The Life & Tragedies of Scott Summers series. It’s funny to me that Sunfire is known as the X-Men’s quitter. Sure, Shiro Yoshida is enthusiastic at resigning but the numbers don’t lie–Scott Summers has attempted to leave the X-Men eight times since the Silver Age. Eight times! And yet, Cyclops has sacrificed the most for the mutant cause. It’s a fight he can never seem to get away from. This dichotomy seems jarring, but things come into focus when you consider his childhood. Cyclops has some pretty intense abandonment issues. The kind that become ingrained with multiple absentee dads. It has shaped much of his personality including his commitment to mutant rights, abandonment impulses, and perspective on family and fatherhood. Today, part three of my five-part analysis of his character, we’ll be looking at Scott’s reputation as a “bad dad”–how he exemplifies the moniker at times and rejects it at others. If you haven’t checked out the previous two parts on Cyclops, “The Boy Scout” and “The Lousy Lover,” I’d encourage you to do so before diving into this family soap opera. I cringe when people tweet me about Scott being a “s----y” dad. It’s the most common complaint that hits my mentions. Cyclops isn’t worth talking about because he left his wife and child, right? Well, I can’t agree. As a father, I’ve had the opportunity to meet a lot of other fathers. What you quickly learn is that there are involved and uninvolved parents. Involved parents care, and Scott cares for all of his kids. He’s a dad who tries his best and often stumbles in no small part due to the examples set for him. Losing both parents in a plane crash and becoming an orphan stole a “normal” childhood from the first X-Man. As an orphan, he was repeatedly abused and manipulated by Mr. Sinister, with the evil geneticist even separating him from his brother Alex. The trauma Scott had to endure at the orphanage was so severe that he repressed his memories. When he finally ran away, it was right into the arms of a lunatic name Jack Winters who “adopted” Cyclops specifically to commit crimes. Had Professor Charles Xavier not intervened, Scott likely would have been jailed. It’s important that we establish the awfulness of Cyclops’ childhood before he went to the Xavier School for Gifted Youngsters. Scott’s life is mired by manipulation and abandonment at hands of father figures and, as I mentioned yesterday, parents are the example from which we understand relationships and how to communicate with others, providing the internal scripts we use to make sense of the world around us. ‘I’m gonna be like you, Dad. According to Dennis A. Balcom, LICSW, abandoned sons often have intense feelings about their fathers, typically in one of two variations. The first is the kind of over-identification seen exhibited by Cyclops toward Xavier. The second is emotional reactivity characterized by statements like “I’ll never be like him!” as seen with Corsair. Scott’s biological father didn’t die in that plane crash. Corsair, or Major Christopher Summers, is a space pirate badass who shoots to kill. Think Han Solo but with a moustache that would make Tom Selleck jealous. When he and Jean Grey meet before the events of “The Dark Phoenix Saga,“ she realizes the family connection and reveals that Cyclops is his first born son. In response, he makes her promise not to tell Scott. Abandonment squared. Scott spent his childhood dreaming of someday meeting his father. He prayed for it every night. Upon realizing who Corsair was, Scott felt happy and angry but mostly numb. His father was a killer, something he abhorred. Worse, Corsair never attempted to find Scott or his brother Alex over the two decades since the crash. Had it not been for the recent death of Jean Grey, the two men likely wouldn’t have bonded over being widowers and begun to mend their relationship. Scott, like many former orphans, was eager to have family. When Corsair offered to introduce him to his grandparents he jumped at the chance, and it was on this trip that Scott would meet his future wife and the mother of his child, Madelyne Pryor. We’ve previously discussed Maddy and Scott’s relationship but the important thing to keep in mind for this discussion is that Scott’s commitment to Charles Xavier’s dream stopped him from being present at the birth of his child, Nathan Christopher. Ironically, Xavier also was a deadbeat dad. This brings us to something I’m sure everyone reading is waiting for: The moment when Scott Summers abandons his wife and child to join X-Factor and Jean Grey. Scott was still too committed to the mutant cause. Maddy had become resentful of the X-Men, whom she blamed for his absence during the birth of their child. She also bickered with Scott over his inability to let go of of his dead ex-fiancee. It was during a conversation about Jean Grey that Maddy punched Scott square in the jaw. The few moments we see of their relationship after this physical altercation tend to feature her belittling Scott or picking away at his character. So no, I don’t think he should have stuck around–which is not the same thing as me endorsing Scott abandoning his child. As a parent, I’ve met many other parents who have separated under difficult circumstances and have maintained a level of care and normalcy for their children. That doesn’t happen between Scott and Maddy. She tells him that if he leaves he shouldn’t come back and when he does, the phone lines are cut, his property is up for sale, and there are no records of his wife and child. It was Sinister, his childhood abuser, come to tear his family apart. I think this is relevant to mention because the narrative I often hear online is one of Scott not being regretful or accountable for the abandonment and loss of his son. If you were reading X-Factor at the time you’d laugh at this suggestion because almost every panel of Scott is him looking disheveled and upset by his choices. Abandonment might be Scott’s first impulse but that doesn’t mean he lacks remorse for his actions. When Scott finally regains his son at the the end of “Inferno,“ the familial bliss is short-lived. Scott is still a part of X-Factor and their greatest villain, Apocalypse, returns to infect the baby with a techno-organic virus. Because he can only be saved by the technology of the far-future, Scott allows Askani (a member of a clan of warriors from the future) to take his son to be cured. It’s a one-way trip from which Nathan will never be able to return. This is probably my favorite moment of Scott being a father because you can see the anguish on his face. He hates the lack of control. That his options have been limited to (1) never seeing baby Nathan Christopher again or (2) letting his infant son die. So he lets go of his son. What would you have done under the same circumstance? Cable, the adult Nathan Christopher, holds Cyclops accountable for sending him 2,000 years into the future after receiving an invitation to Scott and Jean’s wedding in Uncanny X-Men #310. The issue is one of my favorites, actually. Scott shares with Cable the personal log he recorded at the time of losing baby Nathan Christopher before the pair have to team up when the mansion is attacked. Cable can sense the anger and pain in Scott’s log, but more than that, he recognizes something Scott says. As I mentioned in yesterday’s article, Scott and Jean spent 10 years in the far-future taking care of Nathan Christopher. It was their honeymoon. They were going by “Slym” and “Redd” at the time, but the way they talked (known as old English) was the same. When Cyclops says, “The day we stop having compassion for our enemy, Nathan… is the day we become the enemy.” to Cable during the mansion attack it reminds him of Slym and Cable realizes that his father never abandoned him to the future. He was always there for him. The late nineties through early aughts would bring a lot of upheaval for Scott. He’d meet an alternate-universe version of his son Cable named Nate Grey who he’d eventually sacrificed himself for. Merging with Apocalypse during “The Twelve” storyline would destroy Scott’s marriage, but it was all he could do to save Nate’s life. His impact as a father is telling in that when Scott disappears after the merger, Cable began wearing his father’s visor around his neck. Almost like a reminder of what his father stood for. On top of these personal developments, Scott would become increasingly disillusioned with Professor Xavier. He forgave his father figure for becoming one with Onslaught, rationalizing that his achievements weren’t erased by the damage he had done. However, in the years to come, it would be revealed that Xavier had imprisoned the Danger Room (a sentient, robotic Shi’ar lifeform) and had sent Scott’s brother, Vulcan, to his death–erasing Scott’s traumatic memories. 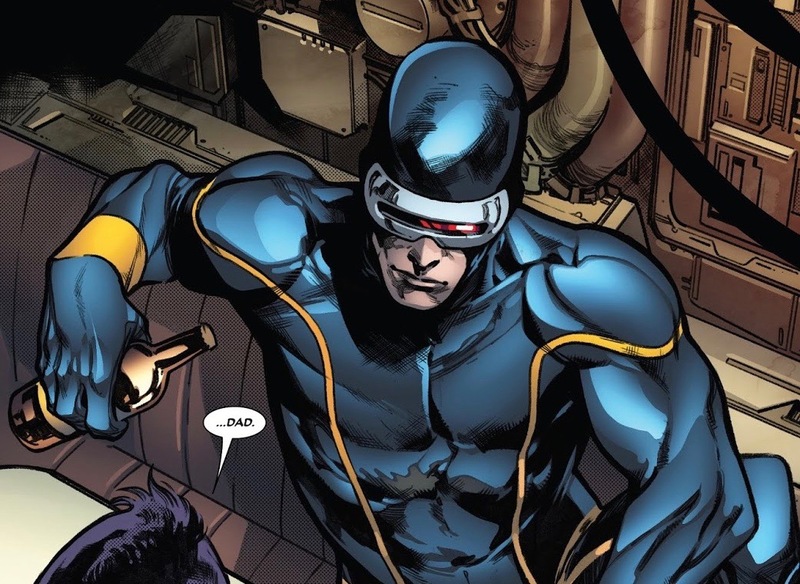 Cyclops, heartbroken by Xavier’s reveal as yet another manipulative father, would tell the founder of the X-Men that he was not welcome at the X-Mansion. The final moment I see as being really poignant to Scott’s development as a father is after the events of “Messiah Complex.” Hope, the first mutant child born since the events of M Day, had been taken into the future with Cable. Yet again, Scott had to give up his child and blindly trust that everything would work out alright. After the events of “Second Coming,” we see Scott crying during a eulogy for his son, Cable. His adoptive granddaughter, Hope, blamed Scott for Cable’s death. He had beaten her to the punch, though. Cyclops knew that actions had consequences and different choices may have avoided the death of his Cable to the villainous Bastion. Thankfully, you can’t keep Cable down and he’d make his return in near future. That brings us to today. Not only have Cyclops and Cable both died in the intervening years, but having come back to the world of the living, it’s apparent that they’ve been working together. I’m sure the dynamic between Kid Cable and Cyclops will be different from before and I’m excited to see what comes next for their family, especially with Jean Grey having returned as well. I hope I’ve provided a broader perspective on Scott as a father as well as what informed his choices. It should be clear that the one moment Top 10 lists like to focus on isn’t the defining one of his fatherhood. He’s made mistakes and he’s learned from them. Stay tuned to AiPT!’s Cyclops Week as the final two parts of this series will focus on Scott Summers, the Mutant Leader and the Revolutionary. You’ll see that some mistakes are repeated.